SANTA CLARA, Calif., Nov. 18, 2014—Magellan, a leader of innovative GPS devices and content services for vehicles, fitness, outdoor, and mobile navigation, is pleased to feature its latest fleet product at the Connected Fleets USA 2014 show from November 20-21 in Atlanta. 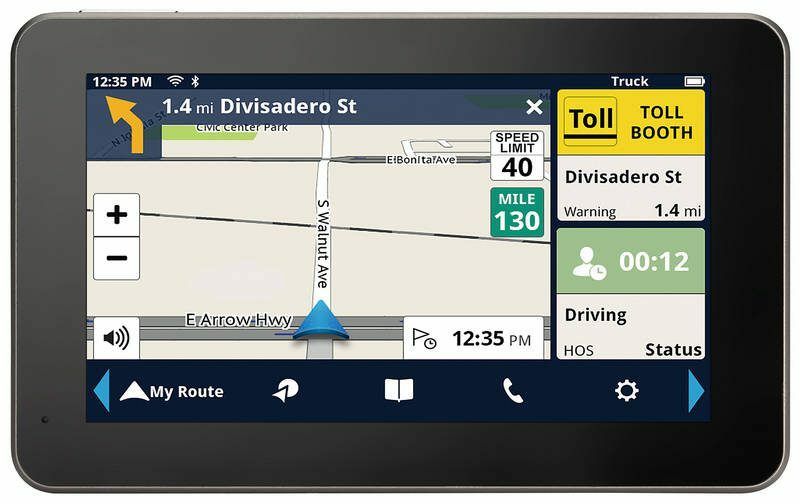 The RoadMate RC9496T-LMB, a 7″ Android GPS fleet navigation device, and the Magellan Fleet Manager desktop tool, will be on display in the Magellan booth (#9) during the show. The RoadMate RC9496T-LMB is fleet ready with a serial port, dash mount, and black-box cable; it has an HD multi-touch capacitive glass display. Its supplemental Magellan Fleet Manager desktop tool enables central office management of bulk software and map updates, route planning (Q1, 2015), and SmartGPS Eco cloud content for Fleet. The Magellan Android Fleet application provides advanced fleet navigation and protocol support, including Hours of Service/Log Book at the device and server level (HOS), and Automatic On-Board Recording Device (AOBRD) capabilities. The application is included with the RoadMate RC9496T-LMB as well as available separately for use on fleet-ready Android devices. Time and money-saving content, which easily can be obtained from the Magellan SmartGPS Eco cloud, provides truckers and fleet managers with real-time local information on fuel pricing, weather (including five-day forecast and overlays), and IP traffic. Customizable Truck Route sets up vehicle profile and calculates routes based on height, weight, width, length, and hazmat restrictions; it guides users according to their route preferences and vehicle profile. Multiple-Stop Routing lets drivers plan their trip with multiple stops in the order they want or automatically optimizes for the most efficient route, helping to save time and money. Free Lifetime Traffic Alerts, sent directly to their GPS unit, lets users plan more precise travel times and ETAs by avoiding traffic jams and other delays. Junction View displays a realistic image of the road and highway signs to help guide drivers to the correct lane that the vehicle needs to be in for safe merging and exiting. Landmark Guidance gives users an easier way to navigate to their destinations by telling them to turn at familiar landmarks, such as gas stations, stores or other large, easily-seen places instead of only street names that may be hard to locate and/or read. Highway Lane Assist helps when navigating complex highway interchanges, ensuring that a driver stays on the correct roadway. Exit POIs indicate where truck stops, food, lodging, rest areas, and weigh stations are located at an approaching exit. Integrated Bluetooth® 4.0 wireless technology allows drivers to safely talk hands free on compatible Bluetooth phones. As the world’s largest forum dedicated to the future of connected mobility, Connected Fleets USA 2014 (previously known as Telematics for Fleet Management USA) gathers the most respected opinion makers and prestigious companies to analyze the challenges that the industry is currently tackling. It will be held November 20-21 at the Westin Buckhead in Atlanta, GA.
Headquartered in Santa Clara, CA, MiTAC Digital Corporation, manufacturer of the Magellan (www.magellangps.com) brand of portable GPS navigation devices, is a wholly-owned subsidiary of MiTAC International Corporation. Magellan, the industry leader for innovative GPS navigation devices since 1986, globally markets award-winning products in multiple categories including auto, RV, commercial, outdoor, fitness and mobile. Continuing its spirit of innovation, Magellan is developing new cloud-based technologies, wearables, OEM, and B-to-B solutions to meet the changing needs of today’s consumers.